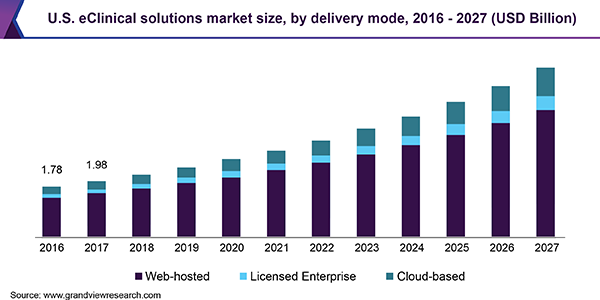 eClinical Solutions Market Is Expected To Record A CAGR Of 13.6% From 2017 To 2025 : Grand View Research, Inc.
San Francisco, United States, 2018-Nov-09 — /EPR Network/ —The global eClinical solutions market size is expected to reach USD 12.00 Billion by 2025, according to a new report by Grand View Research, Inc., progressing at a CAGR of 13.6% during the forecast period. Increasing research and development activities by biopharma and pharma companies, rising application of software solutions in clinical trials, and expanding customer base are anticipated to fuel the demand for eClinical solutions. The eClinical solutions market is estimated to witness phenomenal growth over the forecast period. Technological advancements in the field of clinical trials such as electronic data capture and prevalence of Wi-Fi connectivity are projected to drive the market in coming years. As the demand for tracking and analyzing clinical data increases, the need for effective clinical solutions rises. Unmet needs to manage efficient clinical development process are poised to boost the growth of the market over the forecast period. Moreover, digital transformation in the field of clinical trials and shifting preference towards data centric approach are providing a tremendous push to the market. Demand for integrated clinical IT solutions is increasing due to massive volume of data generated during clinical development processes. eClinical solutions offer single source of information that helps in optimizing the cost by eliminating redundant data entry and reducing on-site verification and source data verification rate. Rising awareness regarding these benefits is propelling the market. Adoption of eClinical workflows in trials offer enormous potential in clinical development processes. These solutions can facilitate decision making in each stage of development. It also helps in reducing cost & time between development phase by utilizing seamless designs & identifying failing compounds. In addition, it offers rapid access to data & patient safety information, which is helpful in making quick decisions.